It was a powerful remembrance of the humanitarian tragedy and the 2009 massacre during the civil war in Sri Lanka - up to 40 000 Tamils were killed in the last five months. There was great strength in the event and much hope as international support is building for an independent war crimes tribunal into the final stages of the war. I have been working closely with the Australian Tamil community now for a year and a half. This has given me an understanding of the pain and suffering the community has faced as a result of the 26 year old civil war. I spoke at the Saturday event and was pleased to inform participants that in July this year the Senate passed the Greens motion (see below) calling for an independent investigation into the war crimes committed in Sri Lanka. Senator Bob Brown moved the motion, which passed unanimously. This was a significant breakthrough and is the first cross party show of support for a war crimes investigation. The motion was partially in response to the absolutely horrifying allegations or war crimes committed against the Tamils presented by Channel 4’s ‘Sri Lanka’s Killing Fields’. The program was subsequently shown by Four Corners in Australia and since then my office has had numerous emails of alarm as to what had happened in 2009 and the continuing injustice in Sri Lanka. Members of the Tamil community have informed me that they are now putting their efforts into calling on Prime Minister Julia Gillard to publicly support an independent war crimes investigation. With the Commonwealth Heads of Government meeting in Perth in October my office is looking into Sri Lanka's membership of the Commonwealth and ways to take the call for an independent war crimes tribunal to that forum. 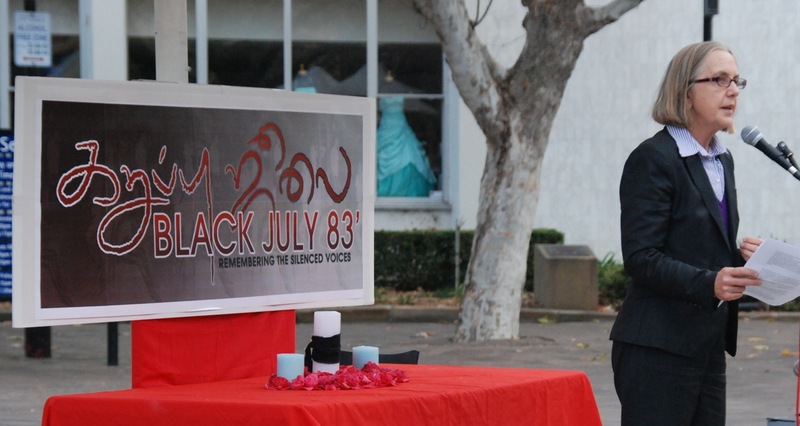 Since the 2010 Black July event there has been considerable progress. British Prime Minister David Cameron has called for investigations into Sri Lanka war crimes allegations. In March 2011 the US Senate passed a resolution in support of an international war crimes probe. Amnesty International has consistently called for one. I hope along with members of the Tamil community that by 2012 Black July we will see that international war crimes tribunal in place. Photo taken of Lee at 2010 Black July vigil in Parramatta. (d) calls on the United Nations Human Rights Council to review its 2009 resolution on Sri Lanka.